The Revitalization Partners team brings over 125 years of experience as CEO’s, CFO’s, COO’s, Board Members, Investors and Turnaround Managers to each of its assignments. Our cross industry experience and ability to operate as a team provides our clients with rapid solutions to corporate problems in the most cost effective manner. 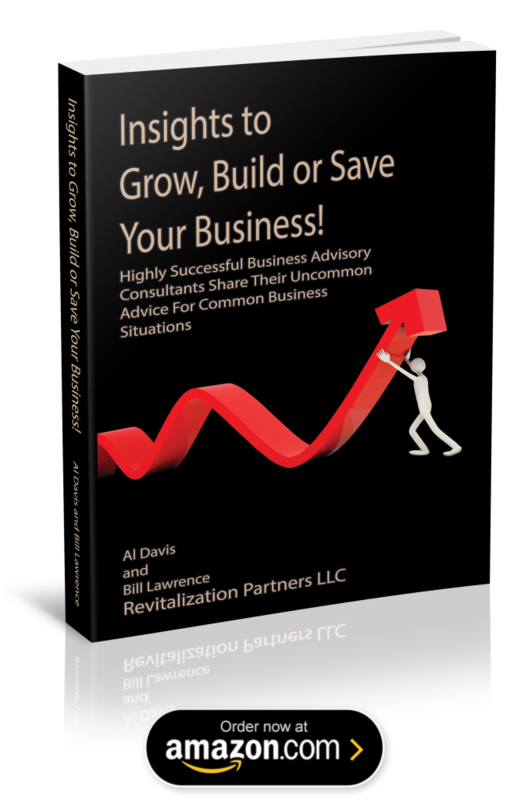 Successful corporate revitalization and redirection have been the results of Mr. Davis’s assignments. He has stepped into numerous companies with faltering business plans that were headed for failure. Al quickly identified unrecognized new markets and new business relationships, defining and implementing courses of action leading to renewed growth and improved profitability. He has served as, CEO, President, Chief Restructuring Officer, Court Appointed Receiver and Management Advisor for public and private companies in such diverse industries as high technology, real estate, media and broadcasting, consumer products, wholesale and retail distribution, wood products and professional services; providing significant returns to both creditors and stakeholders. Mr. Davis has raised over $100 million in venture capital and private equity and has structured and executed a number of domestic and international M & A transactions Earlier career successes include reversing a substantial revenue decline at Advanced Interactive Systems, serving as General Manager of Intel’s Software Distribution and Support Operation, Director of worldwide marketing for Intel’s Microprocessor Division, General Manager for a technology division of Litton Industries and a Sales Manager for Digital Equipment Corporation. As a partner in venture and private equity funds, he has been responsible for guidance and interim management of several of the funds’ investments. Mr. Davis holds an MBA from Pepperdine University and a B.S. in Electrical Engineering from University of Southern California. He serves on the advisory board of Western Governors University of Washington. Bill has successfully guided companies through complex corporate restructuring, corporate renewal and strategic advisory assignments. He brings his experience in strategy, marketing, operations and finance to projects that include leadership roles focusing on repositioning companies for growth and developing long term strategic plans. He also has a broad-based background working in a range of industries including consumer products, retail, manufacturing and technology. Bill has extensive experience working with large multi-dimensional family businesses in guiding them through strategic and operational improvements. Serving in senior level positions as CEO, COO, CFO, Chief Restructuring Officer and Receiver, Bill has successfully restructured public and private corporations maximizing the interests of all stakeholders. His assignments have included: CEO of Pendleton Woolen Mills, Strategic Advisor to Pendleton Woolen Mills and President of Boxlight Corporation. His experience also includes the successful Chapter XI restructurings of Garden Botanika as its CEO and as the CFO of Paul Harris Stores and Jay Jacobs Stores. Bill is on the advisory board for the Apparel Merchandising School of Indiana University and is an active member in the Turnaround Management Association. He also serves as a principal in Revitalization Capital Partners, a $50 million distressed opportunities fund. He is a graduate of Indiana Wesleyan University with a B.S. in Management and holds a degree in Accounting. With an extensive financial management background Tony has assisted a range of companies needing deep financial expertise. His experience includes the Evaluation of reorganization, restructuring and refinancing alternatives, serving as Distribution Manager and Plan Administrator under approved plans of reorganization, overseeing the sale and closure of operations and distribution of assets in liquidation and serving as an expert witness regarding damages, lost profits and business transactions. Tony arranged major debt refinancing packages for Deep Sea Fisheries as well as managing a Plan of Reorganization in Chapter 11 for six of their fourteen companies. As Director of Administration for Color Control, Tony negotiated the purchase of an operating division of a competitor, coordinated the orderly shutdown of an unprofitable subsidiary and represented the former owners in the sale of the company. Tony’s background includes experience as a Senior Audit Manager for Price Waterhouse. He holds a BA in Accounting from the University of Washington and is a CPA in Washington State. Known for restructuring and change management, Jan brings to the table financial strategies and structures with broad experience working with banks, boards and investors. As a seasoned financial executive, Ms. Robinson brings to Revitalization Partners a wealth of broad based and varied industry financial experience based upon solid results, and provides clients strategic, operational and financial advisory or interim management services. In CFO, Treasurer and Controller roles, she has provided counsel in debt and equity financing, mergers and acquisitions, performance management, international expansion, finance and sales operations, led profitable entities across numerous industries and worked with many prominent legal, financial and advisory firms in the U.S., Europe and Asia. In technology, at Credence Systems, Sequent, and start-ups including Logic Modeling, Teseda and uXcomm and at GES Exposition Services, Ms. Robinson improved capacity and performance. She focused on strategic initiatives and on establishing financial controls and systems to deliver profits while meeting the needs of global customers, banks and investors. Ms. Robinson is a frequent speaker on performance management, leadership and financing. She is a member of Turnaround Management Association, Financial Executives International and Oregon Entrepreneurs Network. Ms. Robinson earned her undergraduate degrees in Economics and Middle East Studies from Portland State University and holds a CPA accreditation in Oregon earned while at Moss Adams. Before joining RP, Pat performed engagements as an independent consultant where he helped a number of manufacturing and software companies. His projects included the responsibility for the development of new technologies and business strategies for a media company, reorganizing the enterprise architecture for a multi-million dollar ship repair project, and developing technology and digital marketing implementations for a major online pet retailer. Kern Gillette joins Revitalization Partners with nearly a decade as an advisor to distressed situations and 30 years’ experience as an operating and C- Suite executive, CFO and CEO. Before forming Gillette Northwest, which merged into Revitalization Partners, Mr. Gillette was Senior Director with Alvarez & Marsal North American Commercial Restructuring practice. Prior to A&M, Kern was Principal with Scouler & Company, where he served distressed companies, lenders and creditors across the country. Mr. Gillette has broad and deep experience as an operating executive. Positions include President and CEO of Cinnabon, Molbak’s and Graces Kitchen. He was CFO of Reese Brothers, Cinnabon, Grace’s Kitchen, and Olympic Boat Centers. As President, Chief Executive Officer and Chief Financial Officer of Cinnabon, Inc., the national food retailer and franchisor, Mr. Gillette designed and executed a successful turnaround. As Chief Executive Officer of Molbak’s, a regional specialty retailer, he executed a successful creditor composition plan and led the company through reorganization. As Chief Financial Officer of Olympic Boat Centers, he guided the company through the bankruptcy process. Mr. Gillette also served as Vice President of Finance and Administration at Brown and Cole, a $300 million grocery retailer, where he was responsible for accounting, cash management, risk management, information technology, loss prevention and facility management. His work has spanned a variety of industries, including food processing, multi-unit retail including restaurants, technology, manufacturing, franchise, retail and wholesale distribution, seafood catching and processing, lumber and specialty building products, financial and professional services, aerospace, real estate and construction, and alternative energy. He has direct experience with a wide variety of capital structures including family owned, private equity, ESOP, public, and cooperative. Mr. Gillette served as Financial Advisor for Hot Dog on a Stick, a quick service food retailer, returning over 100 cents on the dollar to creditors and over $5 million to equity, earning M&A Advisor Transaction of the Year award; Beall Corp., a tank and trailer designer and manufacturer, and Qualteq, Inc., a direct mail marketer. Recently he represented lenders interests in a large vertically integrated seafood company transaction, monitoring operational performance and cash management for many months prior to the sale of the entity. Among his many previous engagements, he was Financial Advisor to Contessa Premium Foods, Inc., a frozen foods packaging and distribution company, returning full value to creditors and winning the Transaction of the Year award from the Turnaround Management Association; and Universal Building Products, Inc., a manufacturer and supplier of concrete forms and accessories. Mr. Gillette earned a bachelor’s degree in accounting from the University of Washington and an MBA from Eastern Washington University. He is also a Certified Public Accountant (inactive). Widely recognized as an innovator and a leading woman entrepreneur with over two decades of business and technology leadership, Bernee has served as a senior manager or director of companies ranging from early stage to Fortune 500 enterprises. Her career spans a broad spectrum of products and industries, consumer products, media and broadcast, publishing, and biotech, where leveraging technology was employed to provide enhanced execution and strategy. Ms. Strom’s successes include founding and managing Gemstar TV Guide International, Priceline.com, and MBS Technologies, serving as President/COO of InfoSpace, Inc., CEO of USA Digital Radio (now iBiquity), and as a senior executive of The Los Angeles Herald Examiner. She is a current or past director of the Hughes Corporation, the Polaroid Corporation, ImageX, Software Publishing Corporation, Krug International (currently Sunlink), and DDL Electronics (currently SMTEK). She also serves as a Trustee of the National Public Radio Foundation. Ms. Strom has helped to raise over $1 billion in both public and private financings, overseen multiple M&A transactions both domestically and internationally, and has structured & negotiated numerous industry and strategic partnerships. Ms. Strom holds an MBA from the Anderson School at UCLA, and completed her Masters and doctoral degrees (ABD) in mathematics and mathematics education from New York University. She sat for and passed the CPA exam in California. Mr. Wiese began his career in accounting and financial management with Ford Motor Company and then with Westinghouse Corporation as a Regional Controller with Group W Cable. For more than 20 years, he has served as either CFO or COO of a number of private companies, often working with those in financial difficulty. He has been effective in restructuring the debt of companies facing imminent default or foreclosure, as well as repositioning companies to better attract new debt and equity capital. While CFO with Walt’s Radiator & Muffler, a Northwest regional auto repair and parts distributor, he successfully negotiated a $6.0 million refinancing package. Mr. Wiese has hands-on experience with turnarounds and has successfully reorganized companies in Chapter 11 bankruptcy. As CFO of Silicon Metaltech, he devised and implemented operational and financial strategies which allowed the company to operate strictly on its own cash flow for three years under Chapter 11 until its successful reorganization. As CFO of Cordance Corporation, Lon reorganized the company under Chapter 11, including a consensual plan of reorganization which raised $4.0 million in private debt. During this same time, he successfully resolved $11.5 million in contested employee stock purchase notes and related federal income tax issues. He subsequently raised an additional $5.6 million in private debt for the company. Lon has broad industry experience including Internet technologies, multi-media entertainment, aerospace engineering, cable television, manufacturing, metals and mining, medical devices, wholesale-distribution, and multi-site retail. He holds an MBA in Financial Management and BA in Business Administration from Washington State University. He is a member of the Turnaround Management Association and the Association for Corporate Growth. Gary L. Brookshire has more than 25 years experience as a senior financial executive with extensive experience in corporate recovery and turnaround management. Mr. Brookshire has proven expertise managing highly distressed companies with strong skills in profitability improvement, cash management, cost controls, strategic assessment and SEC reporting. He has served as CFO and VP Operations for companies in distribution, manufacturing and other industries including food manufacturing, equipment manufacturing, medical supply distribution, medical services, garment manufacturing, auto parts manufacturing & distribution and food processing and distribution. Mr. Brookshire has broad experience in managing companies through Chapter 11 bankruptcy reorganization proceedings, to effect corporate restructurings and maximize recovery for stakeholders. He also has managed more than 35 acquisitions and divestitures. Mr. Brookshire is a Certified Turnaround Professional (CTP) and a certified Insolvency & Restructuring Advisor (CIRA) . Mr. Brookshire is an non practicing Certified Public Accountant (CPA) in the State of Washington, and is an inactive Certified Management Accountant (CMA). Mr. Brookshire earned his BBA in Accounting and Finance at Pace University in New York.